Innocent life, whether human or animal or bird is precious. Disturbing such a life, in any way, just because you want to take a picture is wrong, in oh so many ways. inside the Federally mandated limits and conditions for any bald eagle nest and proceeded to wander through the eagles’ territory. Both Kate and Petruchio were instantly up in the air. Tracking the person. 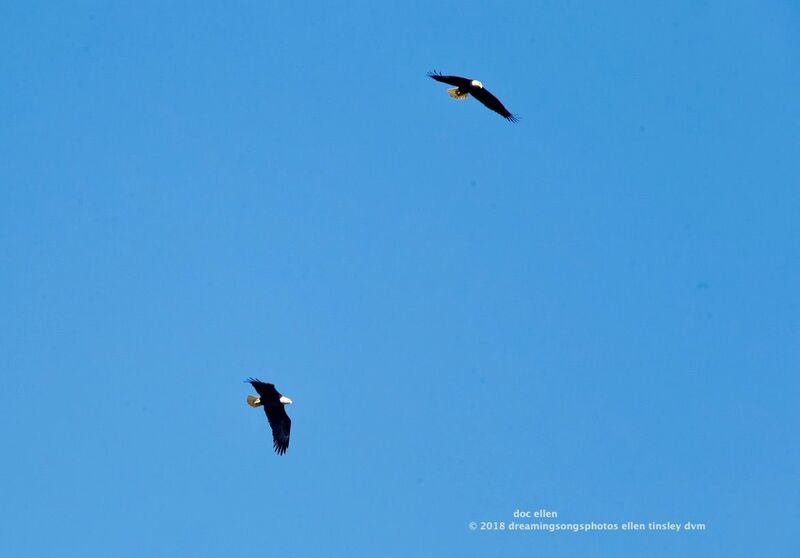 The parent bald eagles circled over head. Fearful to return to their nest because they might lead the human to it. For more than 5 hours both parents were off the nest. This meant that the chick(s) went unprotected that long in very cold temperatures and without food to use to try to stay warm. Another eagle monitor and a birder and I watched. Our hearts aching for the eagle family. Hoping the parents would return to the nest because sometimes disturbed eagles abandon their nest/eggs/chicks. Both parents finally came back to the nest. Neither brought food. They didn’t stay long at the nest. It will be a few days before I will know if the chick(s) survived the human intrusion. Please hold the bald eagles warm in your hearts. Kate is below Petruchio during one of their anxious circles. Note how hard Petruchio is looking downward. Posted in eagle families of Jordan Lake, Eagles of Jordan Lake, Jordan Lake, Jordan Lake State Park, photography, raptors, wild birds and tagged as American bald eagle, bald eagle, bald eagle flight, bald eagle parent, bald eagles of Jordan Lake, eagle, eagles of Jordan Lake, First Nest, flight, Jordan Lake, Jordan Lake State Park, raptor.